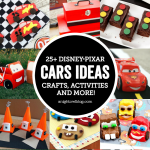 Thank you to Disney Junior for sponsoring today’s post. As always, all thoughts and opinions are my own. 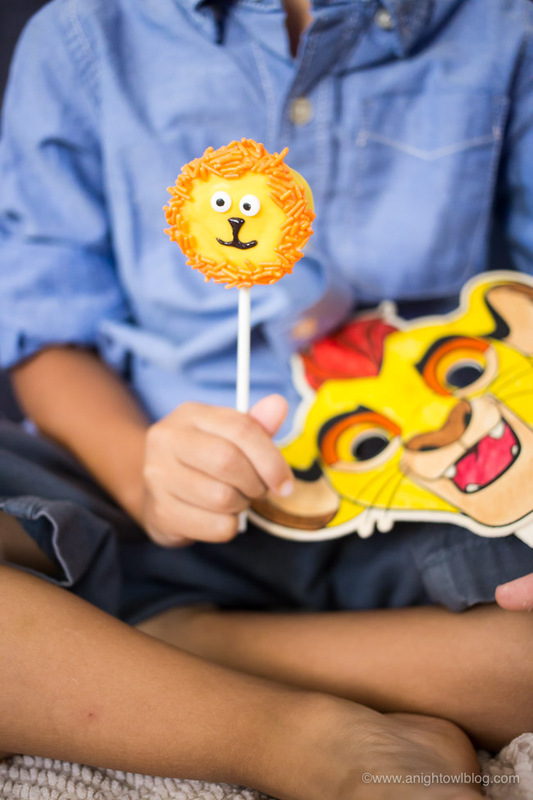 This summer put the YAY in your FRiYAY with The Lion Guard on Disney Junior and these adorable Lion Cookie Pops for your kiddos! Hi friends! What is your favorite Disney movie of ALL TIME? Is that a hard question? Not for me. Hands down, it’s The Lion King. So you’d better believe now that I have little ones of my own that we watch The Lion Guard on Disney Junior on the regular! I started watching it last year with my older boys, AJ and Alex, but now our little one Adrian loves it too! So now that it’s summertime and all the boys are home, when The Lion Guard comes on, we ALL sit down to watch! 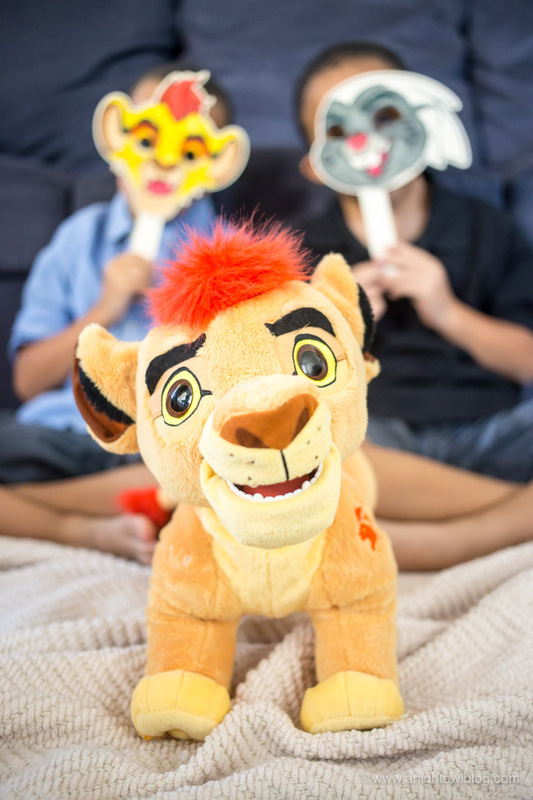 In The Lion Guard, Kion, the son of Simba, leads his friends known as the Lion Guard to protect the Pride Lands. I love how the show ties right in to where we left off with The Lion King. 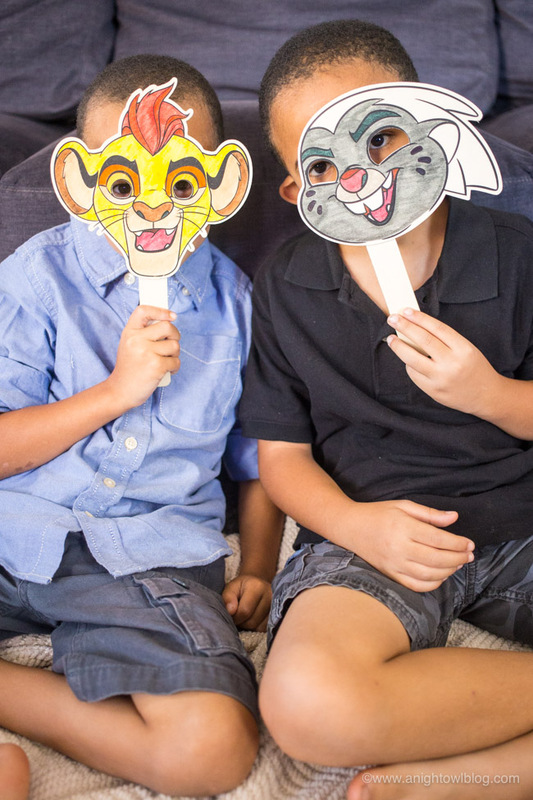 The boys can make the connection to their beloved Lion King films to Kion and The Pride Lands now. I love all of the characters and you know with Disney, there are great lessons to be learned! 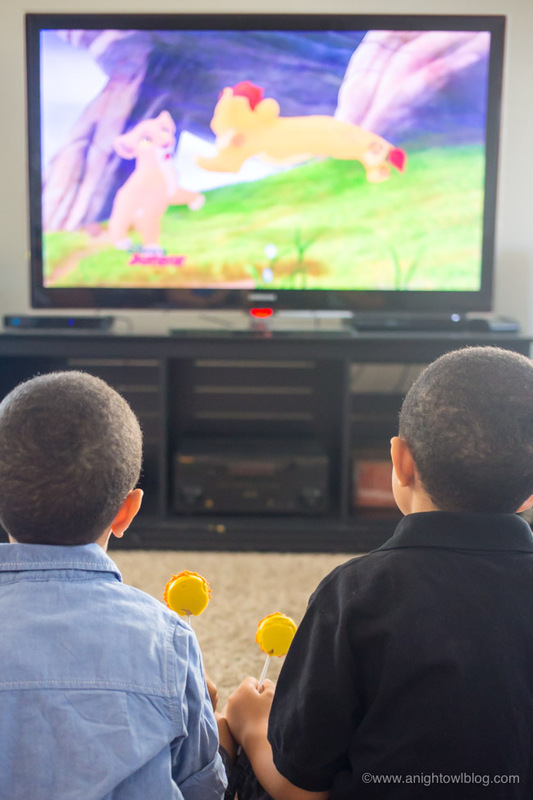 This summer we’re putting the YAY in our FRiYAY with our favorite Disney Junior shows! 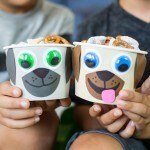 We whipped up some Puppy Dog Pals Puppy Chow Snack Mix in cute little snack cups and of course for The Lion Guard I also wanted to do something fun – a viewing party snack! 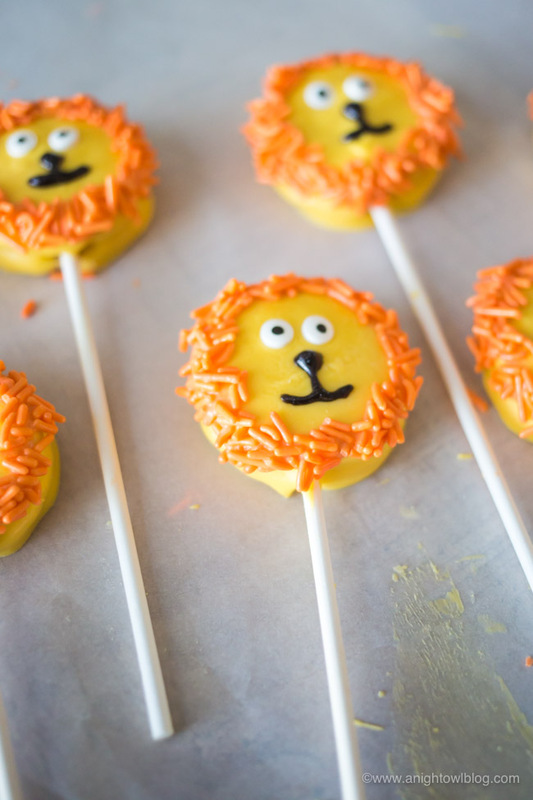 Nothing like a themed treat to make things fun, so we came up with these adorable Lion Cookie Pops! First, melt your yellow candy melts. 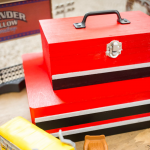 Use enough to fill a small bowl because you’re going to use this to cover your sandwich cookies! 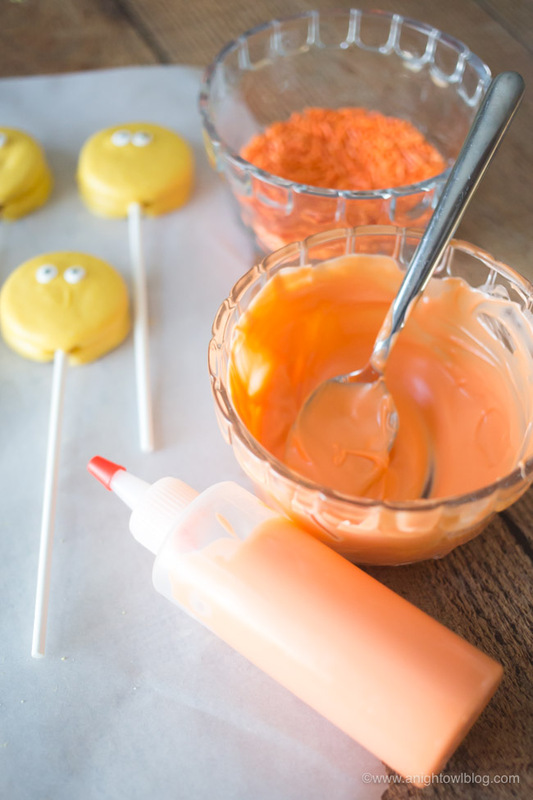 Open up your sandwich cookie, dip a treat stick into the candy melts and press it into the filling on the inside. Close the sandwich cookie and repeat with all the cookies. 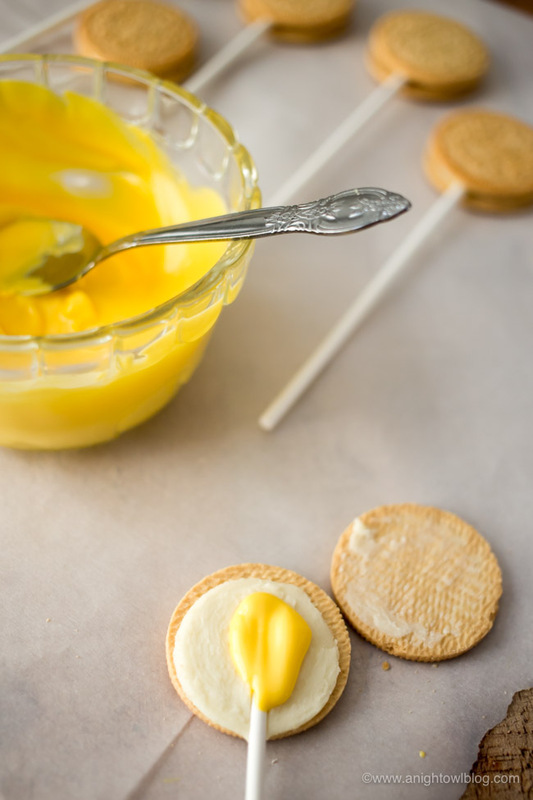 Let the candy melts cool so that your sandwich cookies with sticks will remain in place for the next step. 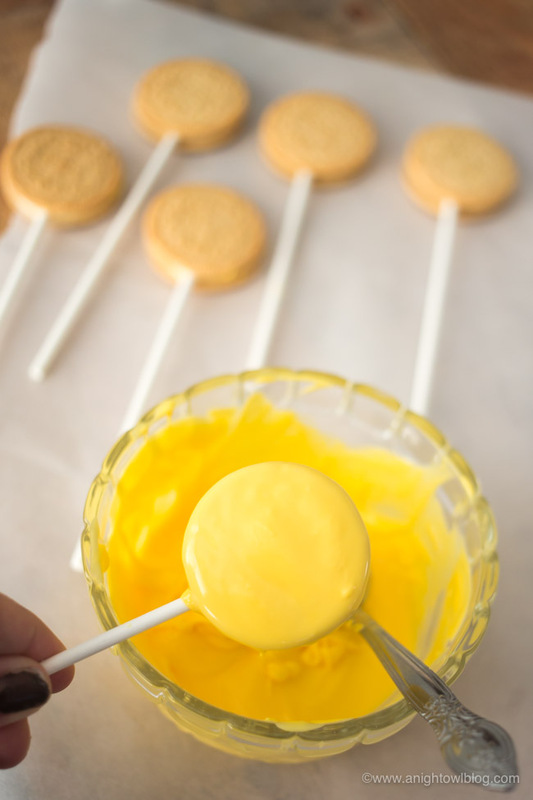 Once the cookie pops are stable and ready for the next step, dip each cookie pop in your melted yellow candy melts. 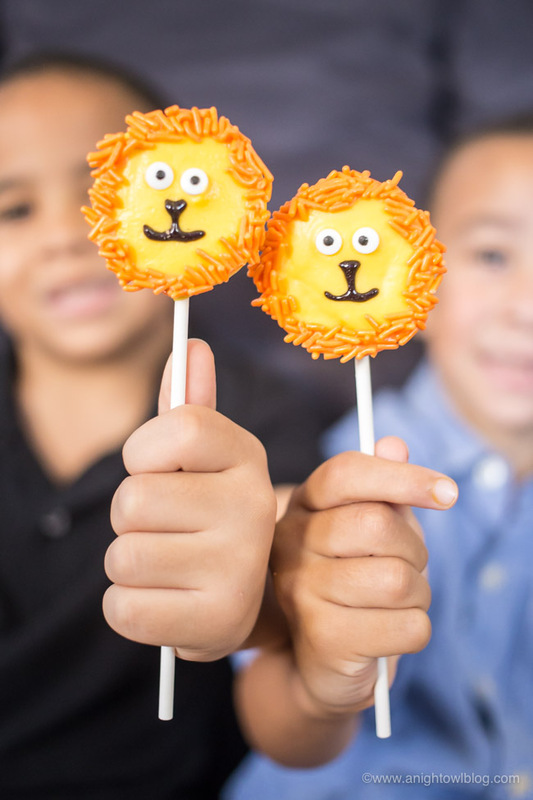 Lightly tap the cookie pop to release any extra and place the pop on a sheet of parchment paper to cool and harden. 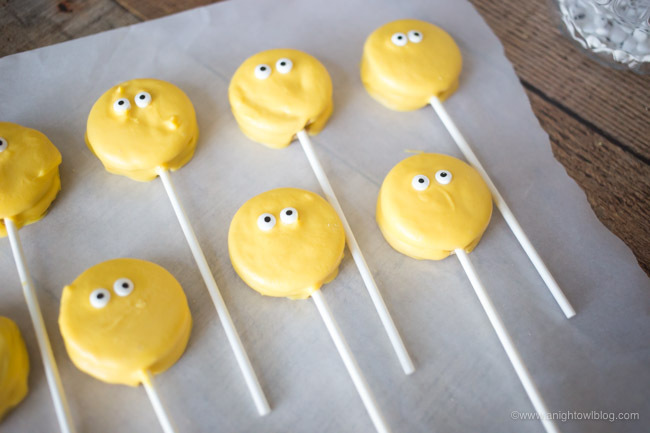 While the freshly dipped cookie pops are cooling, add your candy eyeballs about a third of the way down from the top of the cookie pop. 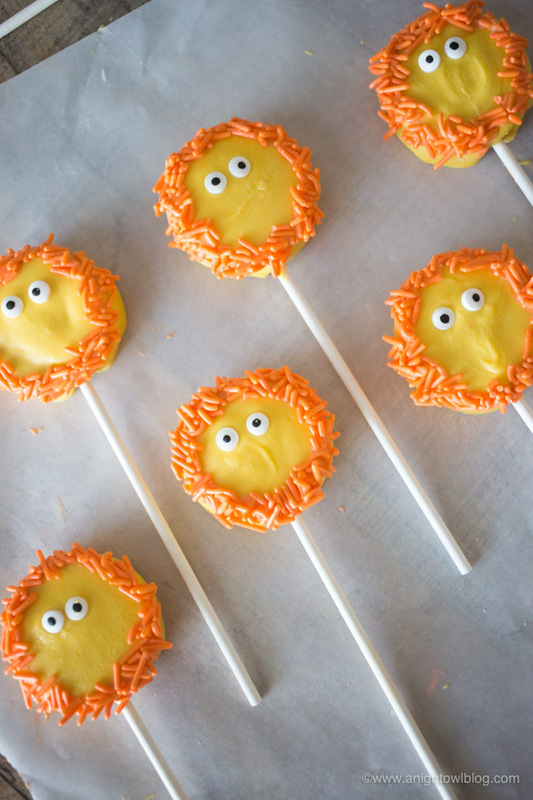 Let the cookie pops with eyes cool and harden completely. This may take a few hours, personally I left them out to cool overnight. 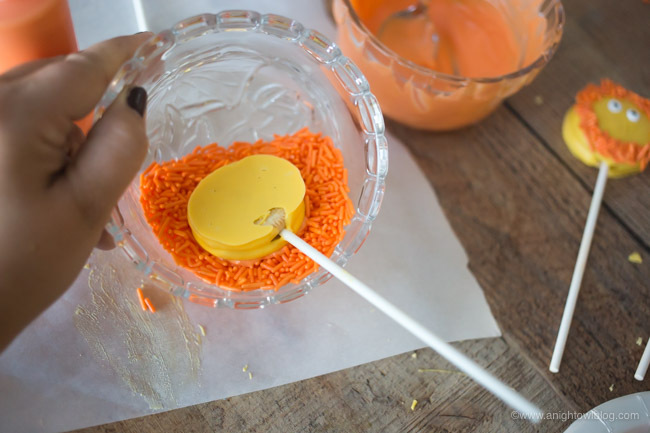 When you’re ready to complete the pops, melt your orange candy melts and for ease of use, transfer the melts into a small decorating squeeze bottle for the next step. 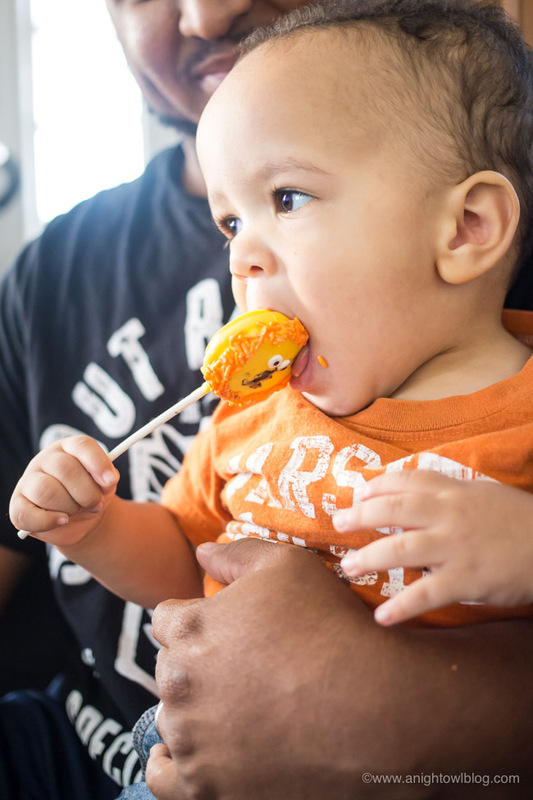 Now circle the cookie pop with your orange candy melts. 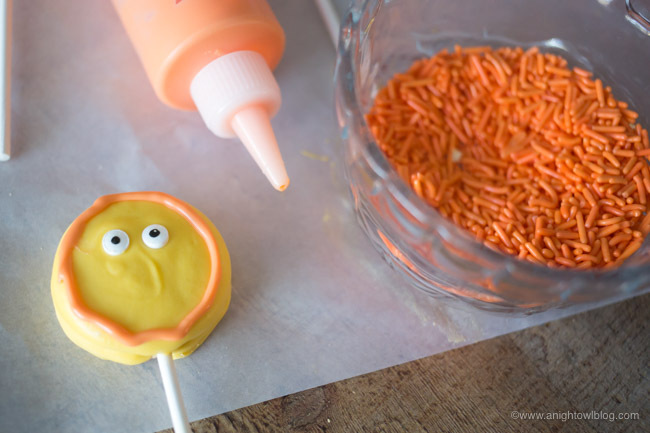 Dip the cookie pop “face down” into the sprinkles. And now you have the lion’s mane! Now for the last step we’re adding the nose and the mouth, which we just did with a simple black icing pen. 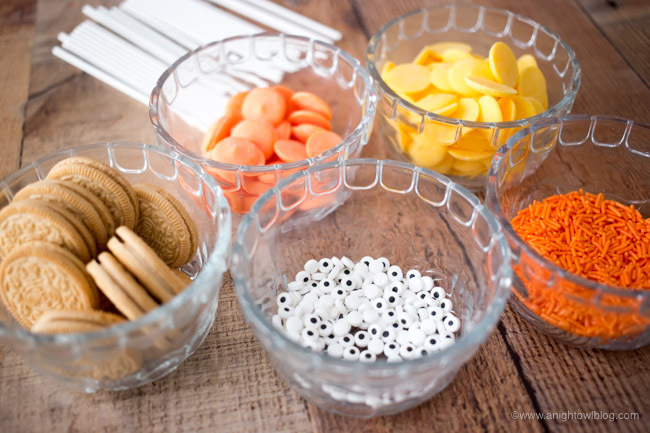 You could also use black candy melts in a squeeze bottle as well for this step. And there you have it. 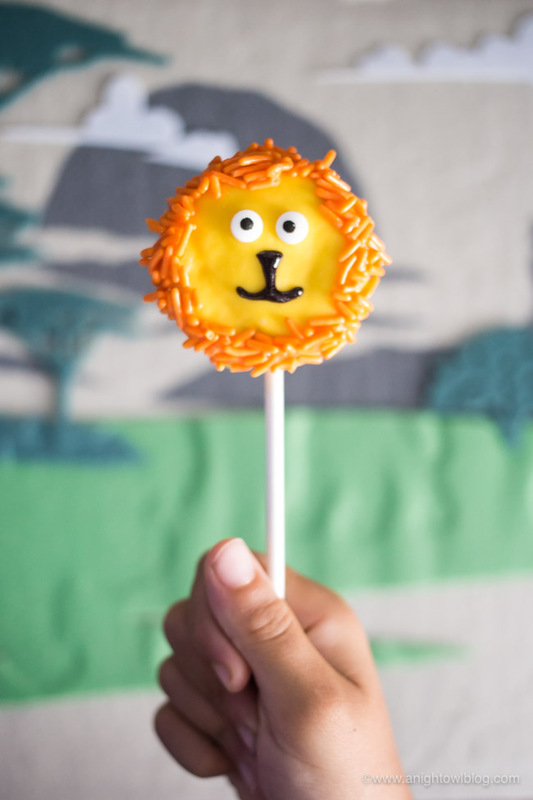 The Lion Guard Lion Cookie Pops! 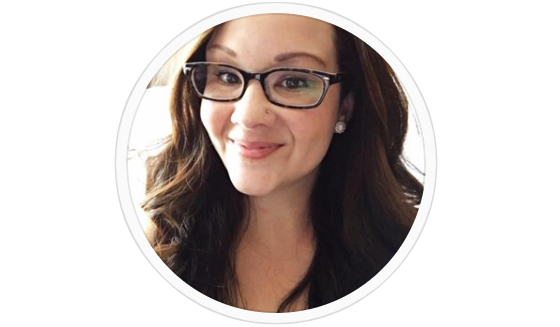 Even my husband said they were stinking adorable – so you know they’ll be a big hit with your family. Now we were ready for The Lion Guard family viewing time! I found these cute masks at our local craft store, so we colored those up for the party as well. 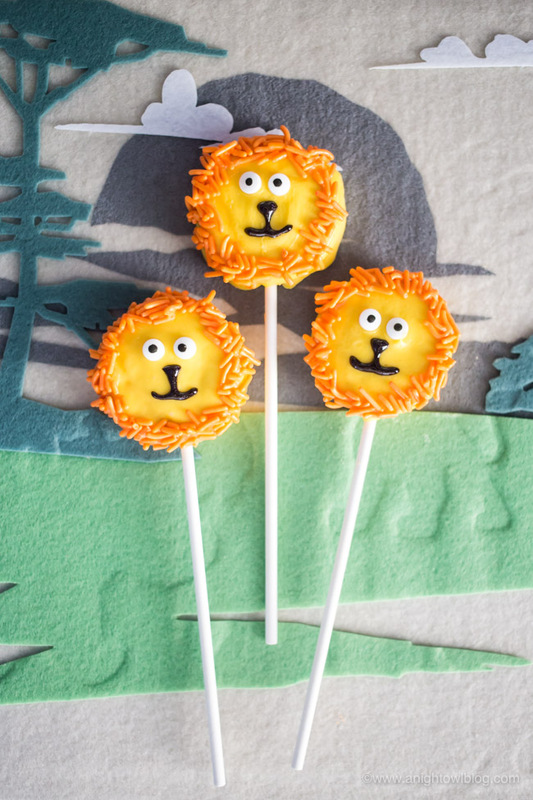 And with Lion Cookie Pops in hand, we were roaring to go! 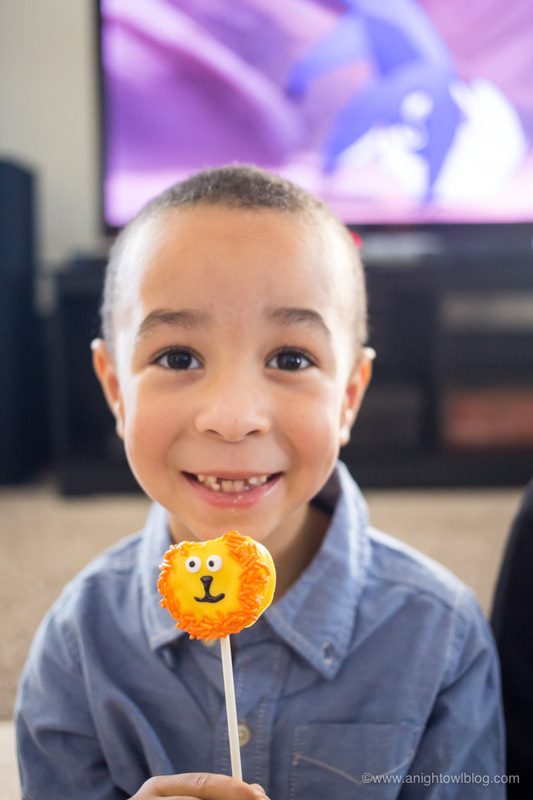 And in case you were worried that Adrian didn’t get in on the fun, he snagged his own Lion Cookie Pop and knew just what to do with it! With Beshte alone in the Outlands, Scar uses the opportunity to attack the Lion Guard’s strongest member. When Kion tries to bring water to the Pride Lands by using the Roar on a lone rain cloud, he causes an unexpected flash flood. The flood is so powerful it actually knocks over Beshte and he’s swept away – all the way out into the Outlands! Kion is horrified that his actions caused this, and is determined to rescue his friend. In the Outlands, Beshte is okay, but must take shelter under ledges to avoid a serious sunburn from the harsh dry season sun. Under the ledges, Beshte meets the duplicitoius Skinks. Under the direction of Scar, the Skinks lead Beshte into a trap. Meanwhile, with Ono unable to spot Beshte from the sky, Kion and the rest of the Guard head into the Outlands to find Beshte. We’re looking forward to it and hope you are too! 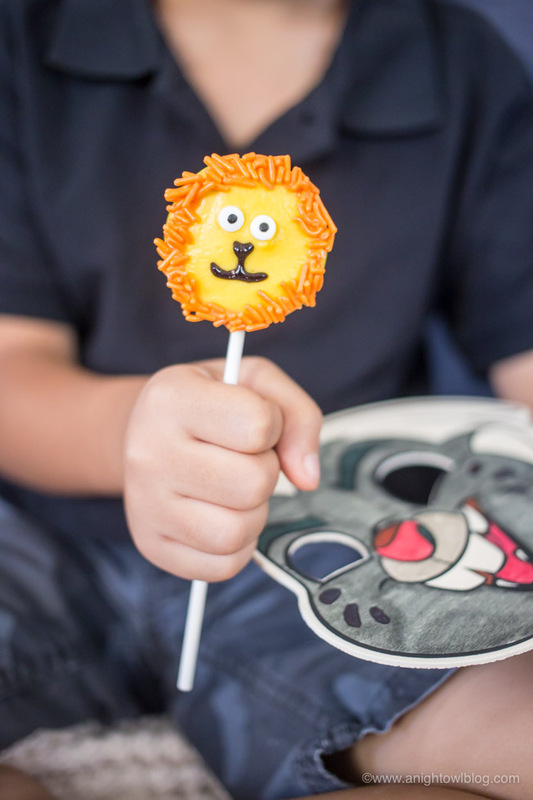 If your kiddos are fans of The Lion Guard like mine are, we hope you give our Lion Cookie Pops a try! 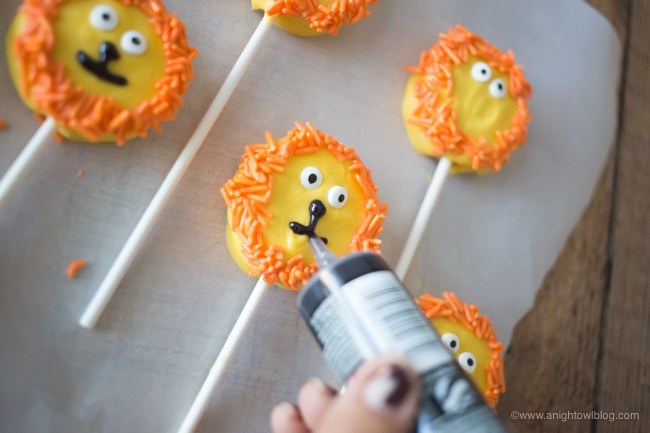 A fun treat for a fun viewing party with your kids. It’s times like these we’ll always remember. 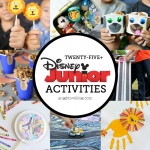 Thank you to Disney Junior for sponsoring today’s post. As always, all thoughts and opinions are my own.